Kamaru Usman is in the UFC to become champion but he's also a prizefighter looking to earn a living and provide for his family. 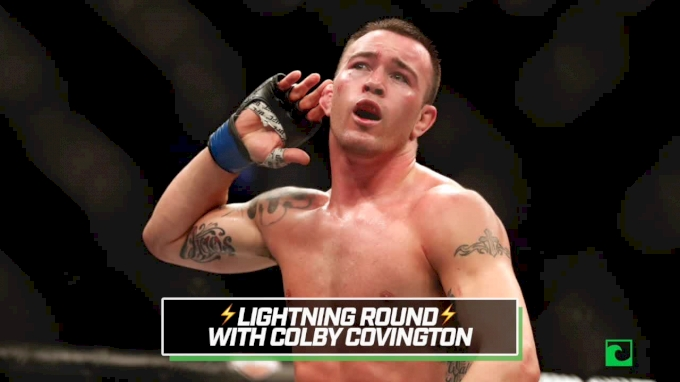 When it comes to the current atmosphere in the welterweight division, Tyron Woodley has been a dominant champion, but Colby Covington might be the most talked about 170-pounder in the world. Now it could easily be argued Covington is also the most despised fighter on the entire UFC roster, but that doesn't mean people won't pay to watch him compete just for the opportunity to potentially see him lose. That's why Usman is honest when asked about who he would rather face in a potential title shot against Woodley or Covington. "Would I rather fight Tyron or Colby? I'd rather fight Colby. Absolutely," Usman told FloCombat ahead of his The Ultimate Fighter 28 Finale fight against Rafael dos Anjos on Friday. "I believe it's a bigger fight. I believe it's a guy I not only get to compete again but I get to compete against with a little more animosity. I'm really going to be trying to hurt that guy." Usman and Covington have traded verbal barbs through interviews and even press conferences in the past but still haven't had the opportunity to clash inside the UFC Octagon. While he may not like Covington or the way he chooses to promote himself through incendiary trash talk, Usman can't deny that it gets attention and that ultimately leads to a bigger fight. "I would definitely much rather have Colby," Usman said. "I talk about it with Rashad [Evans] sometimes, as a prize fighter, as an athlete, before your career is said and done you want to have that one guy that the rivalry is just so thick you can't be in the room with him. When people notice that you're around each other, people know something's not right. People know something's going on. People just feel that animosity. "You've got to have that one guy to kind of define your career." Usman mentions past matchups such as Evans against Quinton "Rampage" Jackson or Jon Jones going up against Daniel Cormier as perfect examples how a rivalry can elevate a fight to a new level of notoriety. Obviously, Usman would gladly face Woodley if he remains champion after facing Covington in a bout that's expected to take place early next year, but he readily admits which one would be the more marketable and more profitable fight. "You need that guy to kind of help you propel yourself and I think that is the fight right now," Usman said. "We're both wrestlers. He tries to talk trash—not very good—but it's working for him. I believe that's a fight that I do need before I'm done. That's a guy I need to beat up." As far as the actual matchup goes, Usman leans towards Woodley winning but as much as he might not like Covington, he says the former All-American wrestler could present problems to the reigning welterweight champion. "It's not as easy as people would think," Usman said. "Obviously, Tyron Woodley has the power to level [him], I think if he hits a horse in the right spot he can knock that thing out. Tyron Woodley has the power to get him out of there but Colby, his style, he has enough that he could frustrate somebody like Tyron Woodley. I don't know. It could go either way. "It could go either way but if I had to pick, I'd go with Tyron Woodley." As far as his title shot prospects go, Usman is only concerned with beating dos Anjos on Friday night but he's also not going to allow himself to get too excited no matter what promises are made after the fight is finished. "I'm not holding my breath anymore," Usman said. "The UFC has blatantly said someone was getting a title shot and that didn't happen. So until I step inside that Octagon across from the champion, I don't believe anything. I have to be inside that cage across from the guy with the cage locked and the referee saying 'you ready?' to believe it. "I've just kind of learned to deal with that and roll with the punches. I've learned not to expect anything."